... Art Journal Freedom , published book by North Light Books, is Dina Wakley's new book. My copy arrived last week and would you believe it actually sat on my reading table for several days before I started it. Don't ask me why since I'd waited for months...go figure. Anyway, the book is a gem and so Dina. All the accompanying photos are of her artwork and supplies, including the step-by-step illustrations of the techniques - one per- that accompany each chapter. So, how do I know the photos are of her supplies - 'cause the items depicted show they've been used, including the photo of Dina (that accompanies the artist's statement) complete in her very-painted apron holding her Dyan Reaveley Dylusions Creative Journey journal in a very non-pristine stage. Art Journal Freedom is divided basically into two parts: The first half covers composition and the second, color - both hallmarks and the underlying structure of Dina's work. She says that "if one understands the principles of design and color, you have power over them, even to break them." Not all the principles of design and color are covered, just primarily the ones that apply to making art journal pages. We are invited, encouraged and even challenged to not only explore the rules but also to play, experiment, create, express, discover, and yes, even to learn from the messes we make, like combining two complementary colors and winding up with brown soup (I can't even begin to count how many times I've done that, inadvertently ;-)). I found the chapters on color especially valuable and one thing I immediately did was get myself a color wheel. Those of us who were lucky enough to take a class with Dina when she was at The Queen's Ink last October (or even other places and online) will feel, as we read and contemplate and play with the ideas, techniques, information and inspiration from the book, that we've re-kindled an old friendship. And if you're at all like me, you'll pull out your supplies, tools, apron, prop up the book and let your muse have a ball! I bet your book will take on the look and feel of well-used - paint splatters and all - and it will be. Just a note: Art Journal Freedom is not just for art journalers; I think anyone in the mixed media and art/craft arena will find something of value. I encourage you to take a look at Art Journal Freedom and oh, by the way, reserve June 7 & 8, 2013 - Dina's scheduled a return visit to The Queen's Ink. Details are still being developed, so stay tuned. 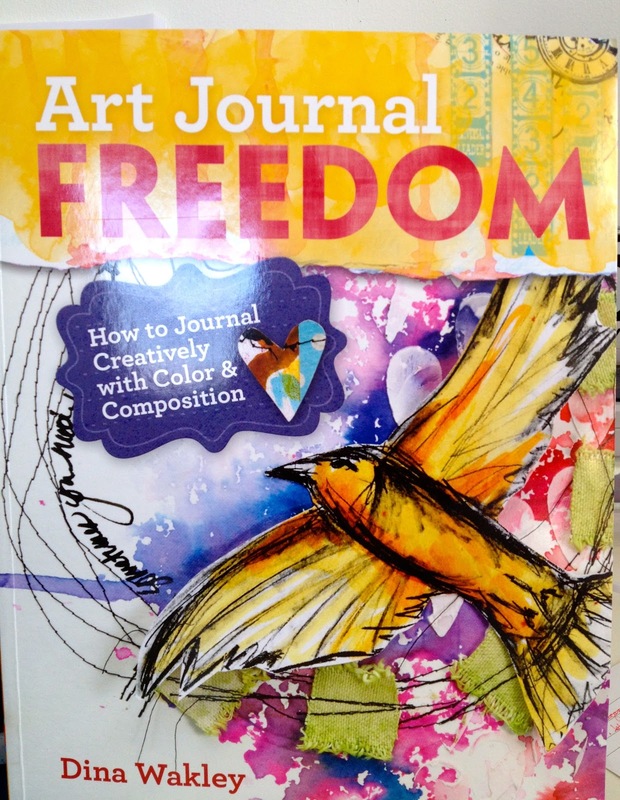 In the meantime, go experience some freedom in your art journal. And if you have the book, we'd love to read your take in the comments.